Alligator lizards, large scaly lizards with slightly prehensile tails, are native to most ecosystems in California with the exception of the highest elevations and most of the deserts. 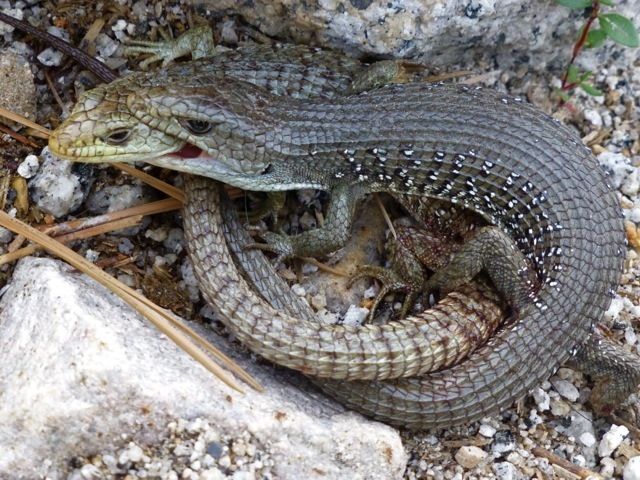 Since these lizards are active during the day, you may come across a particular subspecies – the Sierra Alligator Lizard – on the trails in Yosemite. This lizard species is easy to recognize due to its size as they can grow up to 12 inches in length including the tail. However, Sierra alligator lizards don’t bask on the sun-warmed granite like many other lizard species in the park. Instead, they seem to prefer sunny spots with cover nearby, in case they need to disappear. Alligator lizards live in western states from Washington to northern Baja California, west of the Cascade and Sierra Nevada mountains including islands off the coast of southern California. They live at elevations from sea level to 7500 feet and isolated populations of a subspecies occur in the desert east of the Sierra Nevada, known as the Panamint Alligator Lizard. Alligator lizards may have earned their name from the snake-like undulation they utilize to swim, similar to the way an alligator uses its tail. Common to many types of lizards, the tail of an alligator lizard is easily broken off, and the lizard may intentionally detach its tail as a defensive tactic. As the detached tail writhes around for several minutes, this distraction may deter a hungry predator. Eventually the tail will regenerate, though never in quite the same condition as the original. During the spring breeding season, the male lizard grabs on to the head of a female with his mouth until she is ready to let him mate with her. Besides keeping her from choosing another male, this behavior may demonstrate strength and suitability as a mate. The video of a large alligator lizard below was captured in the fall in Yosemite Valley. Have you ever seen a wolf in Yosemite National Park? The canine creature with the bushy tail you saw on the side of the road or trotting along the trail was not a wolf – it was a coyote. Though gray wolves once ranged throughout the continent, it is uncertain whether they ever lived in the area of the Sierra Nevada that is now designated as Yosemite National Park. The California range of the gray wolf in historic times is poorly understood, and there are currently no wolves living in the state, despite the visits of Oregon wolf OR7 who wandered into California from Oregon for a short period of time in the winter of 2011. 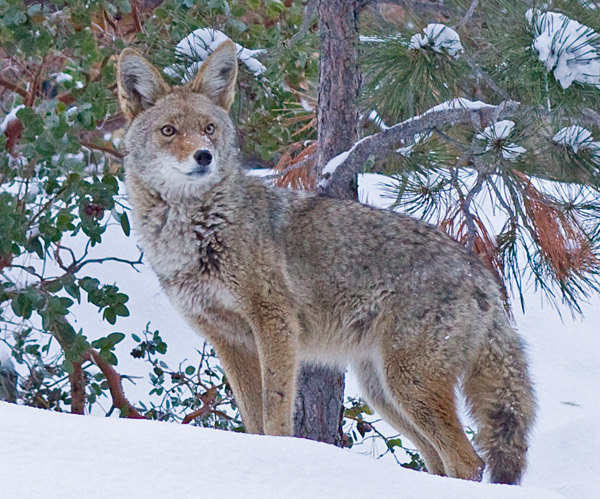 Mountain coyotes, on the other hand, live all over California and thrive in Yosemite National Park. What is the difference between a wolf and a coyote? Canids share many common dog-like characteristics, but wolves and coyotes differ in a number of ways, starting with their overall size. Wolves are much larger than coyotes and if you ever have the good fortune to spot a wolf in the wild, you will never mistake a coyote for a wolf again. Wolves can be up to six feet long versus coyotes’ average length of four feet. Wolves also stand almost three feet at the shoulder while coyotes only measure around a foot and a half. Wolves have rounded ears and a squared muzzle, while coyotes have distinctive pointed ears and muzzle. Though wolves today are found in very few places in the United States, coyotes are common in developed areas and can become comfortable surrounded by the everyday activities of humans. Please remember to respect the nature of this wild animal and do not feed any coyote that approaches you in Yosemite or anywhere else. Keep a respectful distance from any wildlife in the park and enjoy sighting these magnificent creatures in this beautiful natural setting.